Thursday September 22nd 1881 I was busy about the work till noon and worked on my sacque in the afternoon finished trimming it and helped some about putting up the grapes. I played on the piano after supper and gathered up the clothes for the washing tomorrow. 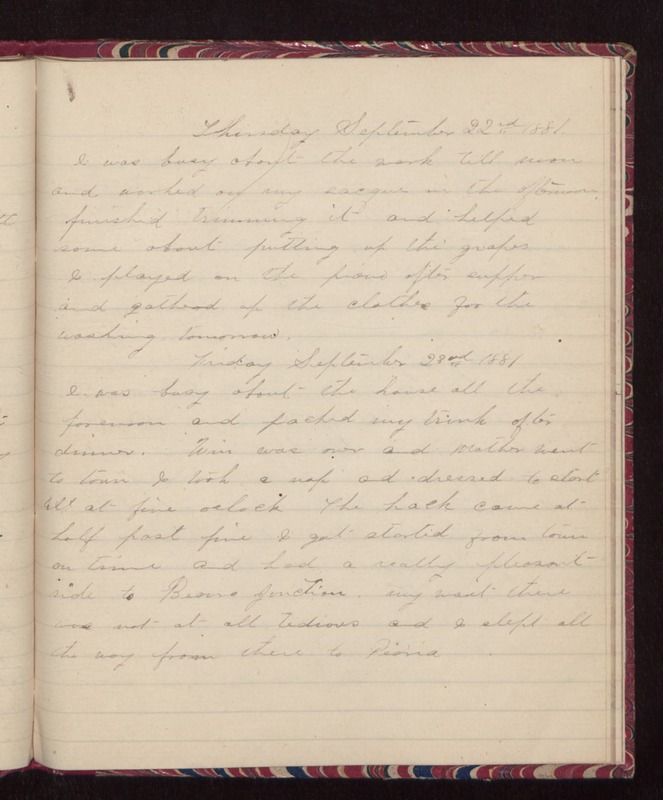 Friday September 23rd 1881 I was busy about the house all the forenoon and packed my trunk after dinner. Win was over and Mother went to town. I took a nap and dressed to start at five oclock. The hack came at half past five. I got started from town on time and had a really pleasant ride to Bureau Junction. my visit there was not at all tedious and I slept all the way from there to Peoria.